On top of the organic results (and sometimes at the bottom), Google shows OneBox results for queries that can be answered instantly or when a direct link can be offered. 1. Music search. Enter the name of an artist or band, and you'll get information, albums and reviews. 2. Movie search. Google aggregates movie reviews and, if you live in the US, Google also offers movie showtimes for the theaters near you. 3. News search. If there is a news related to your query, you'll find it on top of the results. 4. Stock quotes. If you enter a ticker symbol, you'll get live quotes and information from Google Finance, Yahoo Finance and other sites. 5. Weather. Type "weather new york" to see a four-day forecast for New York. This feature is also available outside of the US, but not worldwide. 6. Travel. Type "jfk airport" to find the conditions at the JFK airport in New York. You can also check the status of a flight (n199ua) or buy plane tickets (Madrid to Oslo). 7. Maps. Enter an address and you'll see a link to Google Maps. 8. Local businesses. You can search for something like "pizza in NY" to get information about local businesses. 9. Images. Type "images" or "pics" at the end of a query, and three images will be displayed at the top of the results. Example: "Hawaii images". 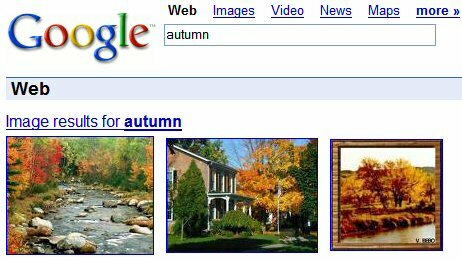 There are also queries that trigger OneBox results, without including these words, like "autumn", because they are popular queries at Google Image Search. 10. Shopping. If you type a product (like "microwave"), the first three results from Froogle are displayed (sometimes Google displays less than three results). You can trigger this OneBox by adding "price", "froogle" to your query. 11. Other verticals via Google Base: cars, jobs, dating. If you type "jobs in California", Google will offer you a list of positions and then further restrictions regarding the distance from the job, job type, industry and a map that shows the location of each job. 12. Google Books and Google Scholar. To get these OneBox results, you need to match the title of a book available at Google Books or of a scholar paper. You can also trigger them by adding "books" or "papers" at the end of a query. 13. News Archive. This OneBox is displayed at the bottom of the search results and contains results from Google News Archive. You can trigger this OneBox by entering historical events like "moon landing" or by adding a year at the end of the query. 14. Google Groups. You'll see this OneBox if you enter technical queries, like an error in Microsoft Office 2007 or a bug from a C++ compiler. 15. Blog Search. Discover recent blog posts that match your query. It might help to add "blog" to your query to trigger this OneBox that shows up at the bottom of the page. 16. Search history. This rare OneBox shows you web pages relevant to your search, that you've already visited using Google search. To see this OneBox you need to be logged in and to use Google Personalized Search. 17. Desktop search. If you have Google Desktop, Google will insert the results from the search with Google Desktop. 18. Definitions. Type "define relevancy" and you'll get a definition of "relevancy". 19. Questions. You can find the answer to simple factual questions like "Albert Einstein birthday", "France population" and more. 20. Patents. Type "patent [patent number]" to find information from US Patent Database (for example: patent 7158961). 21. Local time. Type "time in Canberra" to get the current local time. 22. Phone numbers. Type "Adriana Miguel ny" to obtain the phone number of Adriana Miguel from New York. Read more about reverse phonebook lookup. UPS/FedEx tracking numbers, UPC codes, Vehicules ID numbers (...) are missing !!! It looks like you're using a screen shot very similar to the one I took. I wrote about the Google Dating mashup, if you want a know a little bit more about it. OiHoi.com takes it to another level with "keywords"
Is there a onebox result for services? I would love to see a OneBox showing results from my Google Notebook. The local movie search works in the UK, too. Searching for 'movie', 'film', or the name of the film brings up local showtimes etc. Google didn't show one box results when i searched for "moby".. have they discontinued it? No, I still see the music OneBox. You're probably using an international Google interface, but there's also the music: operator that lets you see music results. Does video or photo content impact your LBL ranking in Onebox or even in Maps? I saw this referenced at http://www.SubliminalMessages.Com and wanted to add that you can enter conversion items such as "7 dollars to euros" and Google will immediately compute it for you. Way cool. What do you think about this? Is this happening with your browsers also? It appears Google is leveraging ILike and other partners for music results - how do you think Google will begin leveraging Freebase.com or Factual.com for data outside of music - people, places and things? Microsoft purchased Powerset is Freebase or Factual next for Google? I find the instant movie local times very helpful, before you had to bookmark the movie time site and scroll and click until you had the sessions and times. Old article but still a valid list and ideas for better ranking. How do you make SERPs show the main pages of your site in a cascading form? .I.e. If I search Pizza Hut on google, I see the site link with the store locator, contact us and specials page below? Is thier any search for , if any tune is uploaded to search for any lyrics,is it able to get related tunes matching the uploaded tune????? http://www.google.com/ig/api?weather= is not working anymore. Anyone know a url that replace it? It was an unofficial API and now it's stopped working. You should try to find another weather API.